Perfect for clothing or handbags! 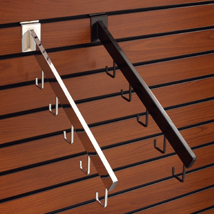 5 J-Hook Rectangular Waterfall is a great way to display clothing or handbags. 18 in. long. Available in a high quality chrome or black finish. 5 j-hook rectangular waterfall is 18 inches long.